The movie tagline accurately justifies what the film Shooter is about. Mark Wahlberg stars as the marksman or elite marine scout sniper who was betrayed on a “peace-keeping” mission. Later after surviving the betrayal he was called upon by his country again, this time to stop a presidential assassination. For honor he accepted the mission but history repeated. Framed and on the run as presidential assassin, this time he want justice. Shooter the movie is based on the novel, Point of Impact by Stephen Hunter. 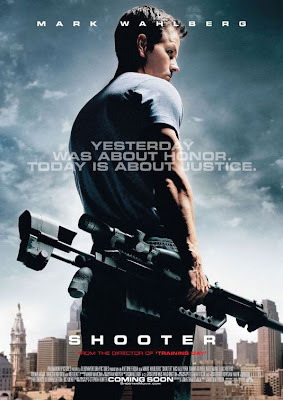 Bob Lee Swagger (Mark Wahlberg) is the main character for the story. His expertise and dedication to the craft of shooting became his poison. He is the best and the best is often sort after but not always look after. There are treacherous people around us with evil agendas. Things are not always what it seem. It is just when you thought you had everything figured out that you start falling, a little wisdom spoken by the film. Fortunately for Bob Lee Swagger, an honorable man with a distinctive ability earned him allies in the form of rookie federal agent, Nick Memphis (Michael Pena) and the widow of his former scout sniper partner, Sarah Fenn (Kate Mara). Through their help he seeks to restore his honor, balance the beam of justice and uncover the bigger conspiracy that surrounds him. Honestly this film really began very well. Bob Lee Swagger displayed his mettle of an elite sniper. The gun fighting action raised the adrenaline and expectation of the film. The film director is Antoine Fuqua of Training Day (2001) after all. There was conspiracy, car chases and hard-hitting actions. What is most impressive is Bob Lee Swagger’s ability of survival and unsurpassed marksmanship. The very system that trained him to survive now wants him dead. Perhaps there were too many targets to aim for with just a single sniper. No doubt Mark Wahlberg played his role very well as the expressionless, cool and intimidating marine sniper but the film in general was missing a lot of targets and thus lost much intensity and grip. As much as the degree of expertise Bob Lee Swagger demonstrated, there was little to engage the audience into the inner world of his, and what this main character of the movie is really about. That focus or the lack of it was not present. The greater scale of the story of having a conspiracy seems to have taken an ill effect. It was not sure what was to figure. Was it the shooter or the conspiracy? In the end Bob Lee Swagger became the invincible, much like Rambo, but less charm, only the brawns and immense shooting ability to kill. That in his own hands became his justice. Which guy doesn’t like guns and which gal doesn’t like a hotshot? Impressive shooting but the target might not go down.